Ingleside Church has a heart for kids, teaching them to Love God, Love People and Change Your World! Children ages 6- 12 start in the sanctuary at 11:00 to enjoy and participate in worship, then go to Superbook Academy until 12:30 for a time of games, crafts or coloring, video and talking together about God. Children ages 2-5 can go to Superbook Kids from 10:45 until 12:30 in our nursery. 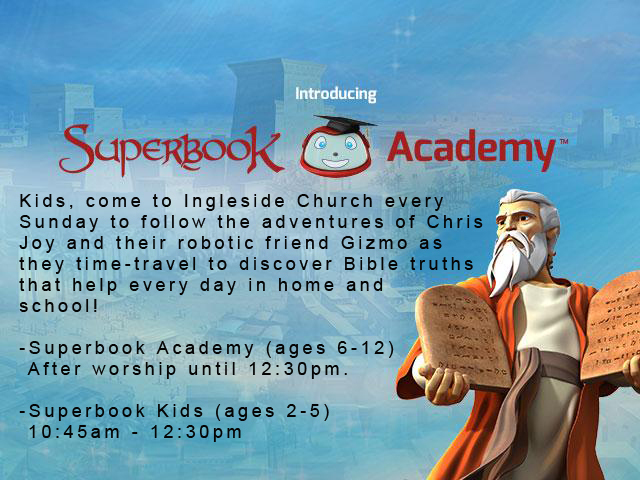 Come and join Superbook Academy!